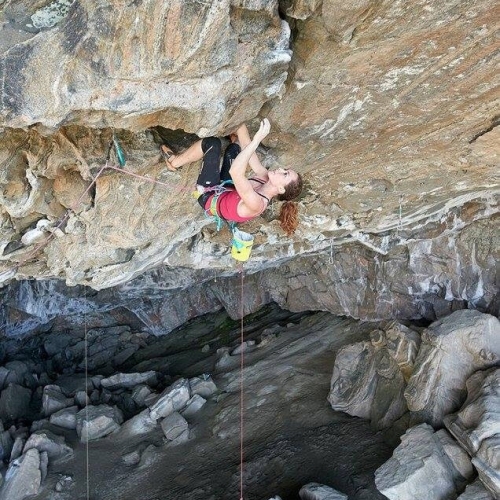 When Ivka Vejmolová from the AIX team did her first 8b+ Gorilas En La Niebla in Spain this winter, it was clear that 8c will “fall” shortly after this ascent. 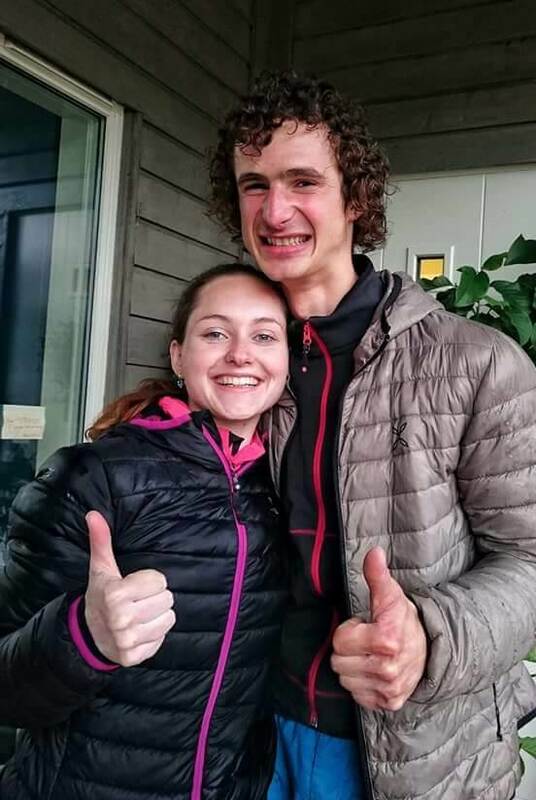 This summer holiday she spent with Adam Ondra in the incredible Flatanger Cave, where she has done Nordic Flower 8c! And to find out how hard was to “pick up” a Norwegian flower, we asked Iva for an interview. Congratulations again and we are sending AIX flowers. 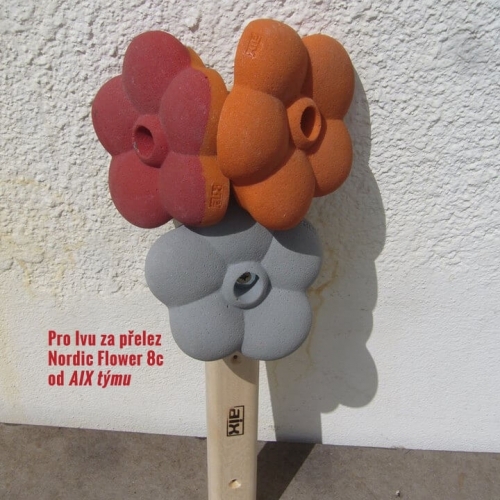 Nordic Flower – beautiful name for the route. Where did it come from? Nordic Flower has been opened in the spring of 2011. Laurent Laporte did the first 20 meters to the “yellow rope”, but then he continued to the Hard Project where he stopped. In the fall 2011 arrived Jorg Verhoeven and continued from the “yellow rope” to the different directions and did the first and second pitch (the remaining 30 meters). After he climbed both of them he graded: the first pitch 8c, the second pitch 9a. 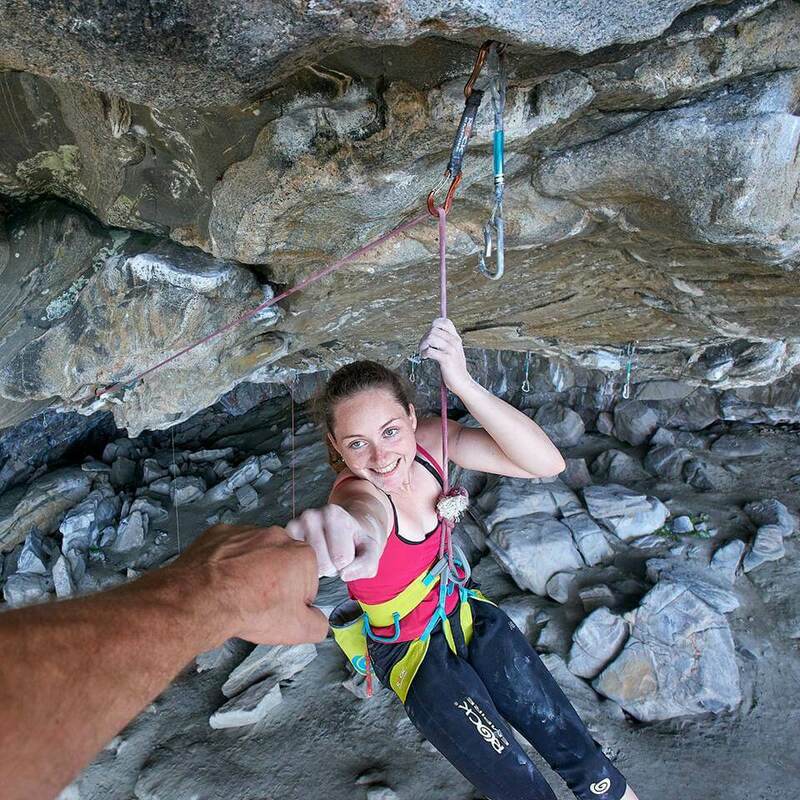 It was the first hard route in the cave. As for the name of the route, I think it really deserves it! Beautiful line! What other charms besides the name the route has? It’s really a breathtaking 50 m line, but with a total overhang of over 30 m. When I saw it for the first time, I did not understand how much climbing is there. When I climbed the Gorilla (my first 8b+) in February, which is 50 m long as well, the Nordic Flower is compared to it hard right from the start. And I must say that I had a great respect for this route! First you had done the shorter version 8b. 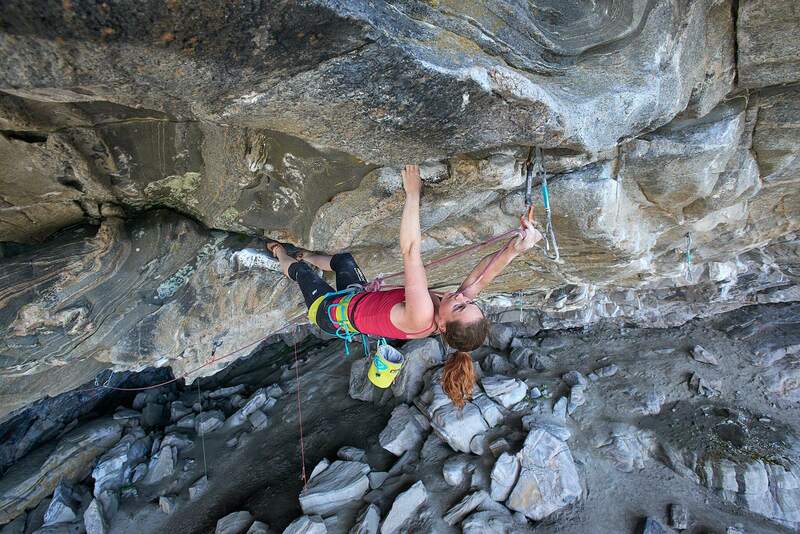 What motivated you to try the extensions 8c? It was a little different. I went to Flatanger climb my first 8c and Nordic Flower was the most appropriate choice, because it’s kind of women style. So the first pitch 8b was such a touch of local style. However, if someone told me after I did the first pitch I would climb the second one, I would tell him that he is crazy, because I was totally wasted. My legs and knees hurt and I don’t even talk about my back. Well, I took a few days rest and I started to “run” the first pitch as nothing. Without that I wouldn’t have chance to send the second pitch. Yes. Our trip was a little complicated. Right after the European Championship at the end of June, we went to Flatanger. The original plan was to stay there for 3 weeks and 4th week to travel Norway. But Adam got sick, like a few other people who were there with us. I kept myself giving more rest and tried to stay healthy. At the moment when I was ready for the attempts (I mean the real send of Nordic Flower), I got ill. I was quite sad, my body was weak, in the climate It didn’t want to get better and our trip was coming to an end. 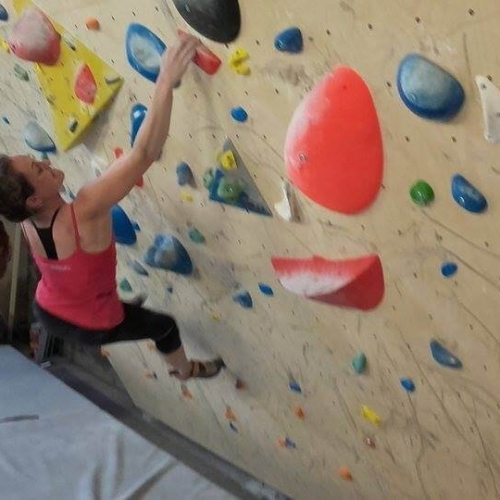 Eventually, my illness at least brought more time for Adam to made some new progress in Project Hard and also Adam persuaded me to stay longer to finished my climb. 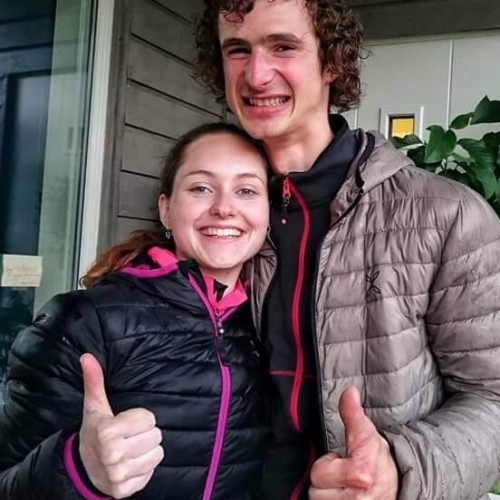 But I didn’t really believe it after the illness, because I couldn’t breathe well during climb… so we stayed longer for a week and I fortunately send it! How did go the trying of Nordic Flower? It was quite interesting. I had very good go one day in absolutely perfect conditions and I fell above to the hardest crux where I thought I wouldn’t never fall but I did and the desperation that followed… I hope to quickly forget it. But later on I found out that even machine Mina Markovich fell there too. Mostly I am able to give 4 attempts per day, but in cave Flatanger only one good attempt per day, the strenght of the body go away very fast. So I hesitated if I try again, because I felt back pain. Finally, I did. It was rainy, windy and holds were suddenly damp. Adam was positive as always, but he is not a good liar, so when he said in his comforting voice that it would definitely get better, I didn’t believe him at all. But I never give up. 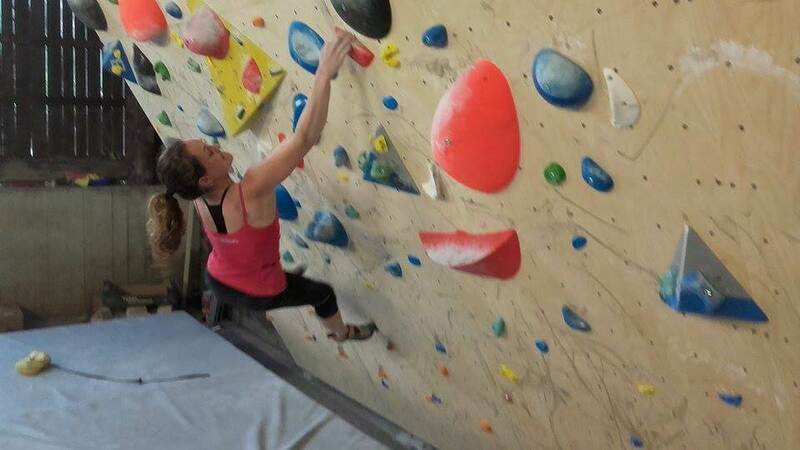 After the “yellow rope” I climbed badly, but then I didn’t want let go. So two meters from chain and at the same time before the last hard section, began to go tears in my eyes. I had to force myself to stay calm, because otherwise I would fell because I would not see any holds. But after I clipped the chain, it was definitely the greatest joy I have ever experienced in climbing and a few tears of joy were there too. All these emotions were probably because it was the route I had tried the longest time and the psychic played an enormous role there. Could you describe the route? 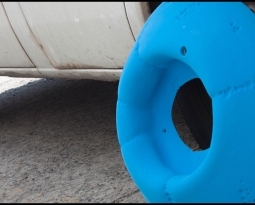 Adam helped me a bit, because I haven’t got the right estimate yet. So after the 5th quickdraws (for me 35 moves) it’s supposed to be 8a+, which consists of two quite hard boulders. The strong fingers are an advantage there. Then there is a kneebar, where I am able to let go my both hands for a moment. Then you climb “easy”, but typical Flatanger 8a (45 moves for me), which ends in a really good kneebar, where the climber must drag the rope. And then there is only 7b+ to the chain of the first pitch (another 48 moves). And after this comes the second pitch, which comes out for another 55 moves. 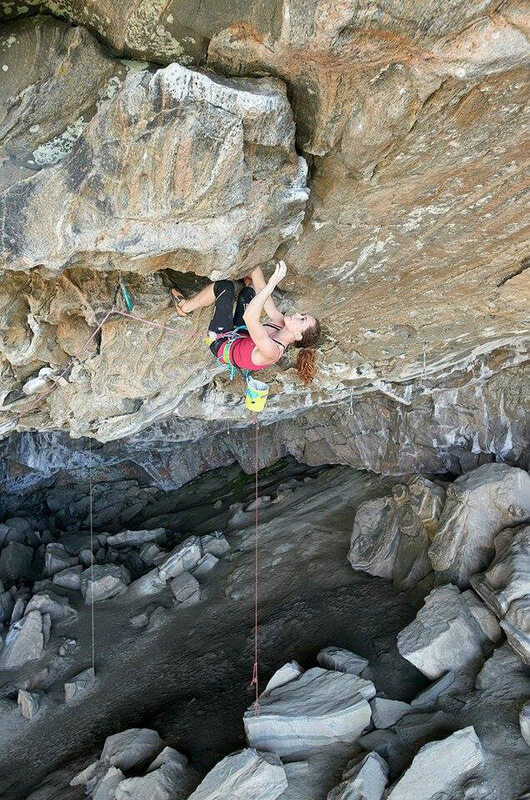 The crux starts right after the first pitch and finishes after 7 meters. And who know how to shake arms to get rid of pumped forearms, wins. 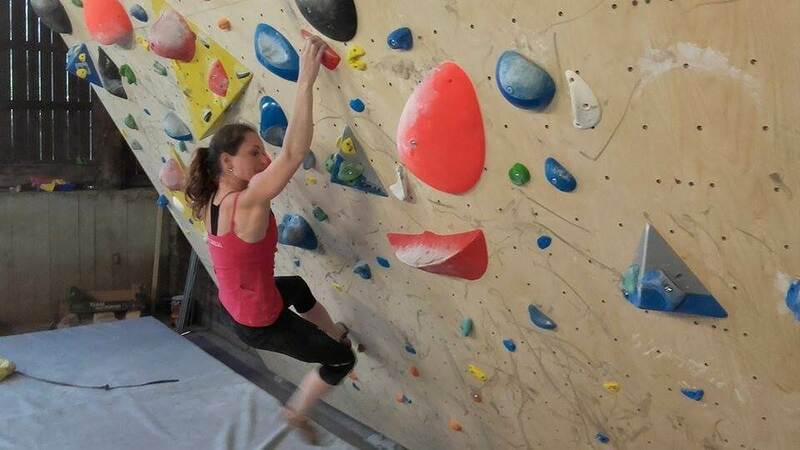 So for successful ascent are needed strong fingers, to know how to shake arms to get rid of pumped forearms in kneebars, body strength, endurance. Which section gave you the hardest time? I was struggling with traverse in horizontal cracks, which starts with “7b+” at the end of the first pitch. Both legs have to be stuck in the crack, because they aren’t any holds, so you have to somehow get over it to reach further holds. So, at first I was really afraid that my legs would stuck there when I fall… The key to a successful ascent was definitely climbing speed, I couldn’t believe it, but in long routes speed is necessary. Then it must be everything fine-tuned, no mistakes, endurance in the knees, and strong head. Climbing in Flatanger looks overhanging, a lot of cracks, sidepulls, it’s not about climbing right, left hands. 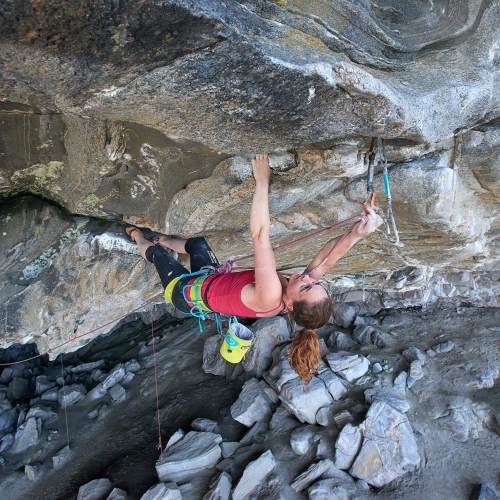 How would you describe the climbing style there? Climbing on Flatanger is very specific. I think most people have to get used. Just like me. 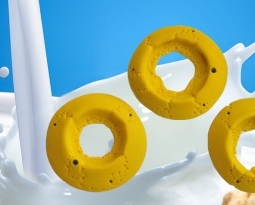 There are only slopers, no crimps, sidepulls, footholds on the places I don’t need them. But when you start love it – took me about one week, it is just great! The structure and shapes of the holds are absolutely beautiful and I’m not talking about the surroundings! That would be another interview. 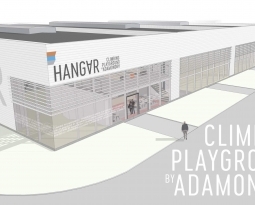 It was definitely a big climbing school for me and kicks me a lot in the future. I definitely recommend everyone! It’s worth it!!! 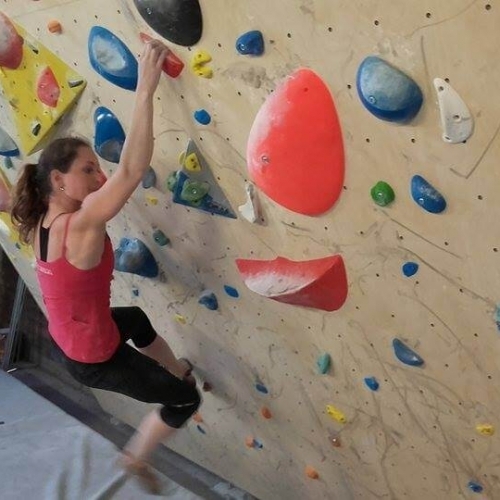 Did you train together with Adam on bouldering wall in the barn? 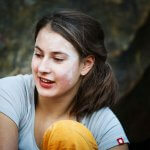 Boulder wall, which was provided by Pavel Blazek and his girlfriend Tyna, was great for me and Adam after illness. 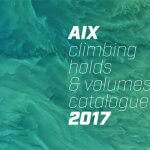 Great thanks to AIX for support and help with holds. Without this new training torture house in the barn in the camp, we’d be down and out. You already have Norwegian flowers, but what about Adam, did he give you a puget of flowers? 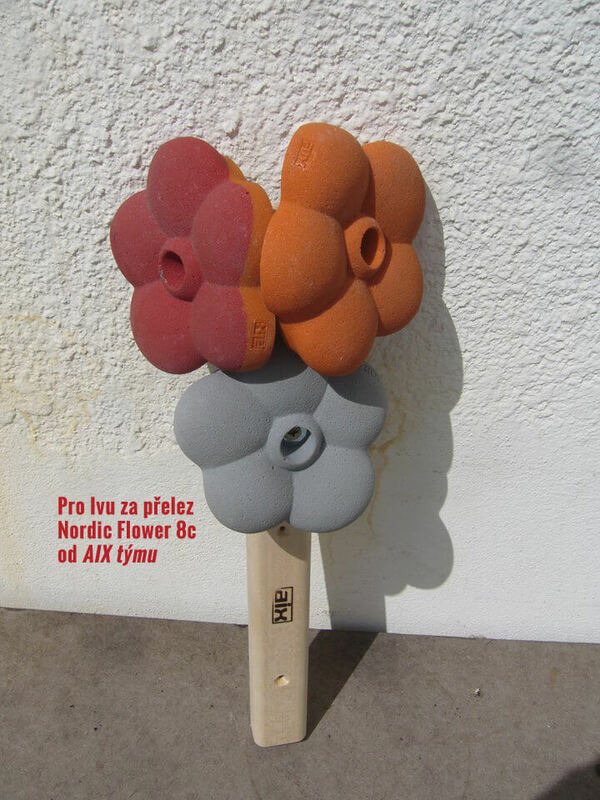 Big congratulations again and the AIX flower are on the way to you! Thanks for the interview.